The front lobby of the Ocean Club Bahamas. Enter here to dine at Dune. 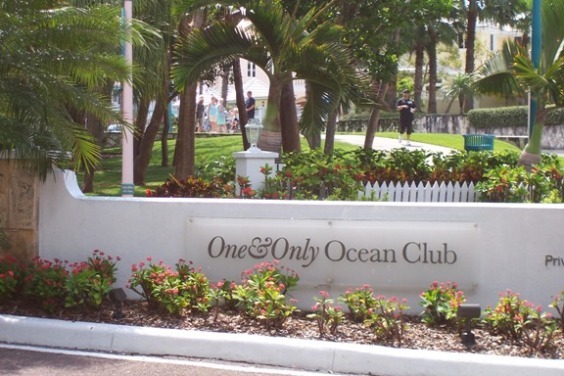 The One & Only Ocean Club is an exclusive resort - with prices to match. 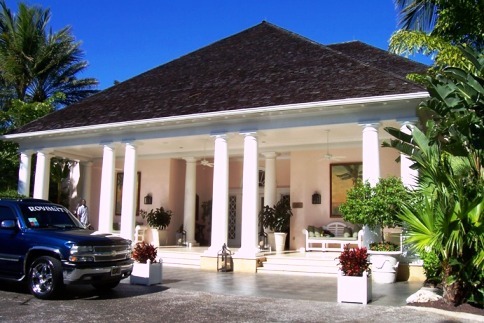 It’s a lovely, elegant place, with exquisitely kept grounds, gardens, pool area, and one of the best restaurants in the Bahamas. For guests and non-guests alike, the lovely grounds are the perfect place for a quiet stroll away from the crowds and noise of other parts of the island. If you’re not staying here, plan to at least have lunch at Dune, the gourmet restaurant right above the beach. Although it’s a pricy menu, you can appreciate the view and take a look around the grounds before heading back to your own accommodations. Just in case you're not up to walking in the heat, a convenient free shuttle transports guests to and from the Atlantis Resort. 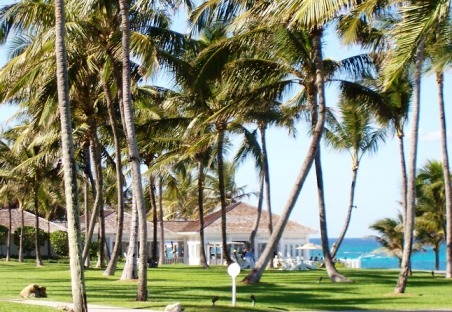 The latest James Bond film, Casino Royale, featured several scenes filmed at the Ocean Club. It’s worth checking out the scenes to get a feel for what it’s like. The Ocean Club is on the northern part of the island, and the North Atlantic can get rough here, so depending on the weather, the surf may be too rough to go in the water at all. On the other hand, the beach is a long walk from the public access roads, so the crowds and local vendors don't usually find their ways here. From the people who I've surveyed who have stayed there, the service, however, seems to be the stuff of which travel war stories are made. Although I have been there many times for cocktails or a meal, I've never stayed there and probably never will based on what I've heard. My advice it to stay elsewhere, save your money, and come to see the Versailles Gardens and the Cloisters when you’re in need of some peace and quiet. Also worth a look is the Versailles Pool at the Ocean Club, where attendants spritz sunbathers with Evian mineral water.